"My work explores the use of line and space to describe nature and the body through multi-dimensional drawings - combining my interest in drawing, and how line can depict form, with the spatial presence and materiality of sculpture. The starting point of my work is the natural world - both seen and unseen - what can be observed, but also what science (particularly physics) and ancient beliefs/mythology can reveal - paring down the detail to find the principle form. Through sensitive use of form and material, I create delicate-seeming but actually robust forms which become part of their environment rather than imposing upon it, adding an element of mystery and discovery. 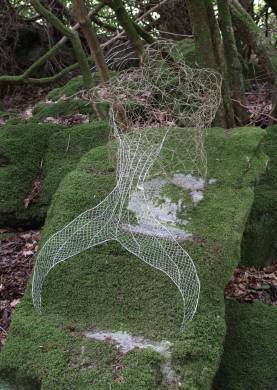 I use fine wires to weave patterns that outline figures, and construct forms which appear to float in space. Using pine needles in geodesic triangulation I have developed a technique which allows the construction of life-size figures from this fragile material.